As we have all heard ad nauseum, there is going to be a new 2014 Corvette debuting next year. But we haven't heard full details on what sort of engine is under the all new hood. The next generation Corvette engine is the Gen V LT1, which is a direct injected V8. There was a ton of speculation about the displacement, with early reports placing it at 5.5 liters, like the C6R race car. 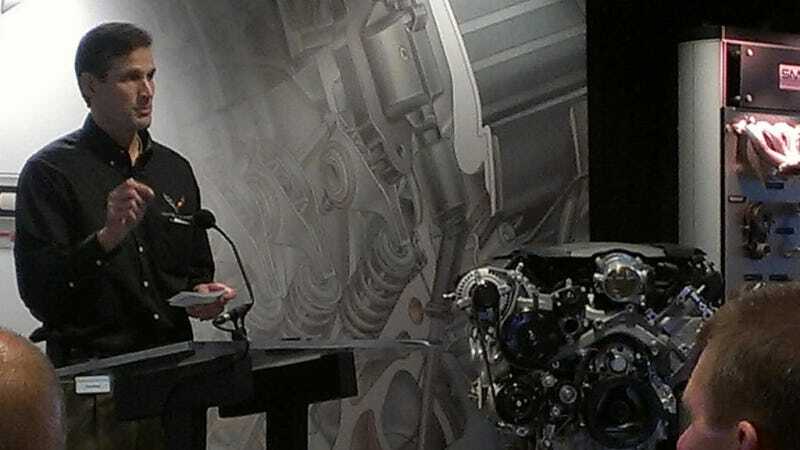 This morning, GM has confirmed that the LT1 will be a 6.2 liter engine. It also gets some advanced tech. The LT1 has cylinder deactivation to increase fuel mileage, which is reportedly more than 26 MPG on the highway, direct injection, dry sump lubrication (which will be an optional extra), and variable valve timing. While more efficient, the LT1 is also expected to provide a nice power increase over the current LS3. With at least 450 horsepower and 450 pound feet of torque, the LT1 is up 20 horsepower and 26 pound feet of torque. It actually has a slightly better power curve than the might LS7 that currently powers the Corvette Z06. And in a car like the Corvette, which is already a lightweight, that is pretty significant. Engineers anticipate a 0-60 time of less that four seconds for the C7 Vette, a car that will cost around $50,000. We'll see the wrapper that this engine will come in on January 13, 2013.